I hope you are all having a great week! This week has been crazy for me and I am really looking forward to a little down time this weekend to relax. What's better than sleeping in on a Saturday morning in your very own bed? Nothing. For me, when I think of the most relaxing place in the world--it's my bed. Sure, I'm in love with the Beach and taking romantic vacations in Hotels with Spa's, but when I'm think about everyday life (and I'm thinking realistically), nothing beats laying in my comfortable bed surrounded by plush and warmth. :) Sounds pretty perfect, huh? Long Canopy-like drapes create a romantic feel to a room. I love how these puddle on the floor! I'm obsessed with this storage cabinet. I love the rustic look it has and it's filled with a few of my favorite things--old quilts, books and pillows. This room is lovely. I love the neutral colors and the simplicity of it. Decorating pieces are the key to making any room look incredible. I love the old frames and how it's a few random things thrown together. 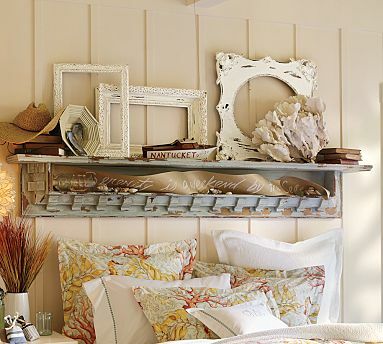 You can't go wrong with a beautiful mantle over your bed, either! This room is so chic. 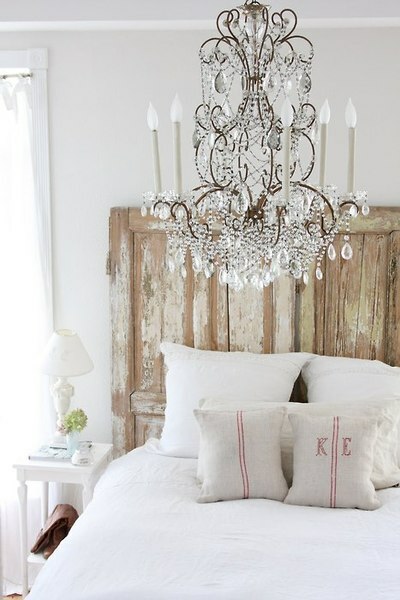 I adore the rustic headboard and light fixture. These are two pieces that surprisingly look amazing together. Plus, I love the monogrammed pillow.